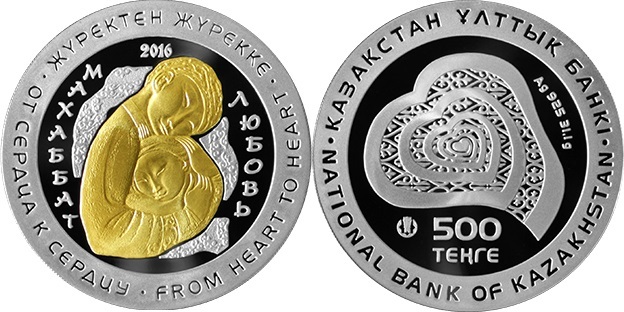 The National Bank of the Republic of Kazakhstan announces the issue, effective from 20th December 2016, of the commemorative coin “Love" – a silver coin of “proof” quality of the nominal value of KZT 500 under From heart to heart coin series. «Love» is second coin of the series "From heart to heart" designed to reflect human values through the coins and make sence of an original message from people-to-people. Coins of this series will become a good gift for relatives and people in love. Weight: 31.1 g. Weight is indicated without coverage.